when i lived in houston and went to house of bowls with my friends, we would always order their shrimp and egg chow fun dish. have always wanted to recreate it on my own. i tried to look up recipes online but didn’t get much luck, so i had to combine recipes. 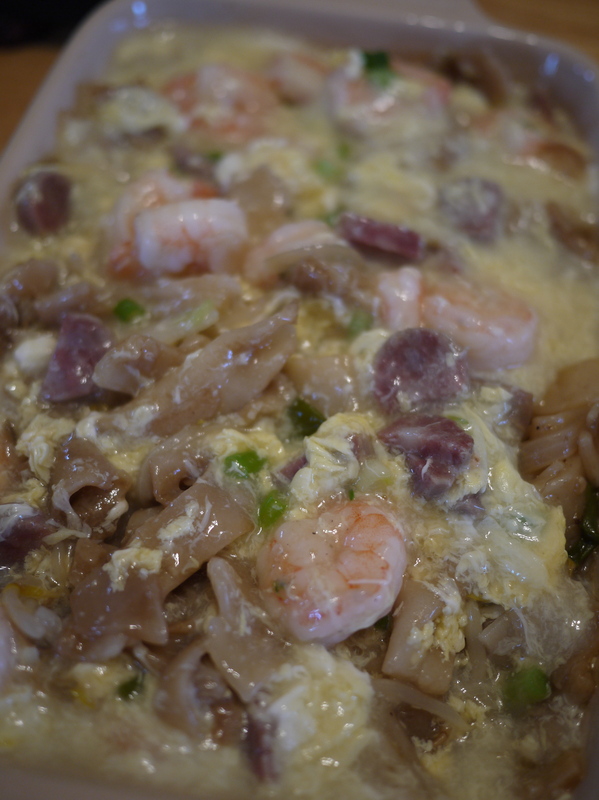 i also added chinese sausage, you know, just cause…it’s delicious. overall, the dish turned out pretty well. In a cooking pan (you’ll need a larger one, preferably one where the edges curve up like a wok) over medium-high, saute the onions until caramelized. Turn the heat up to high, then add the hefen noodles and saute until the noodles have softened. Add soy sauce and S&P for flavor. Add the bean sprouts, sausage, and green onions and continuing sauteing. Transfer the noodle mixture to a serving plate (find one that has a deeper dish so you can pour sauce on top). Season the shrimp with S&P and saute over medium-high for 4-6 minutes until done. Transfer the shrimp on top of the noodle mixture. Lastly, pour the chicken stock into the pan. Make the cornstach mixture and pour it into the stock, only after it has boiled. After the stock becomes a more gooey AND is bubbling, pour the beaten eggs in. Once the egg is cooked, pour the sauce all over the noodle mixture. I hear the wings are amazing! I’ll have to try them next time I’m there! What is S & P ? Is that salt and pepper? ← get in my pork belly!